The Mississippi Watershed Management Organization (MWMO) is one of about three dozen watershed organizations in the Twin Cities Metropolitan Area. Its mission is to lead, and to foster stewardship of the watershed with actions that promote civic ownership and measures that achieve diverse and functional ecosystems. Its boundaries include the Mississippi River as it runs through Minneapolis, as well as the land that drains to the river. The MWMO contains portions of the cities of Lauderdale, Minneapolis, the City of Saint Anthony Village, Saint Paul, Fridley, Columbia Heights, and all of Hilltop. The final member of the MWMO is the Minneapolis Park and Recreation Board. The MWMO will provide for the long-term management of its water and associated land resources through the development and implementation of projects, programs, and policies that respect ecosystem principles and reflect changing community values. For more information, go to www.mwmo.org. 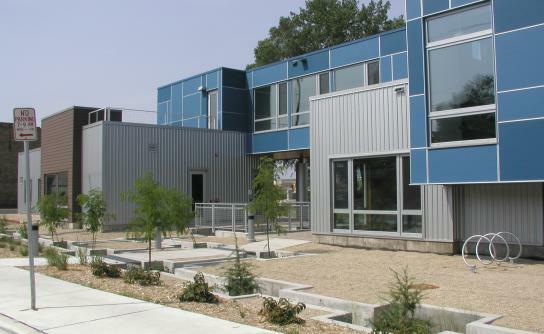 MWMO building, 2522 Marshall Street NE. Built 2011.